Zurich was recognised with a Digital Award at the European Awards Ceremony in Poland for its 'Cost of Education' campaign. (L-R) Niamh Mac Sweeney, Content Development Specialist; Andrew Rodgers, SEO Specialist; Sean Carty, Head of Online and Digital Marketing; Emer O'Neill, Social Media Specialist; Clare McCarthy, Digital Marketing Specialist. Zurich's recent Digital campaign, 'The Cost of Education ' has won 'Best Use of Search - Finance' at the European Search Awards in Poland. The awards recognise the best European digital and content marketing and attract hundreds of entries from all across Europe each year. Zurich faced international competition from huge online brands like MoneySupermarket and GoCompare, both of which concentrate their efforts primarily on online visibility in the financial sector. 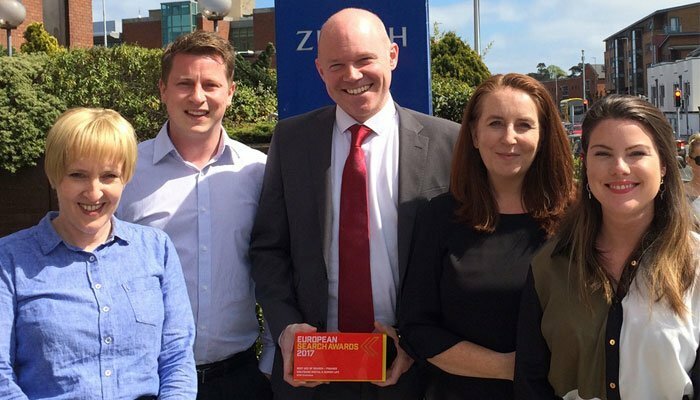 Sean Carty, Head of Online and Digital Marketing at Zurich said he, his team and their agency Wolfgang Digital were delighted with the win. "This is a huge achievement for Zurich and we are honoured to have won such a prestigious award, especially given the high calibre of entries." By producing digital content around the topic of the cost of education, Zurich was able to position itself at the centre of this conversation. According to Carty, the results were resounding. "Traffic to the Cost of Education section on www.zurichlife.ie increased by 1,562% year-on-year, sales of Zurich's savings plans increased and traffic to our savings products pages are now 64% higher than the previous record." Carty added: "We aimed to increase our long-term visibility on Google for savings search terms like 'savings plans' and 'cost of education', and we achieved what we set out to do. Google have rewarded Zurich with several 'featured snippets' at the top of their search results which is a strong indicator that Google considers Zurich's content to be valuable and relevant." The European Search Awards are an international competition that celebrate the very best in SEO, PPC, Digital and Content Marketing in Europe. The awards, now in their sixth year, attract hundreds of entries from some of the leading search and digital agencies across Europe and the winners were chosen by an international panel of industry leaders.